It’s January, which is like Christmas here in healthy food blogger land. 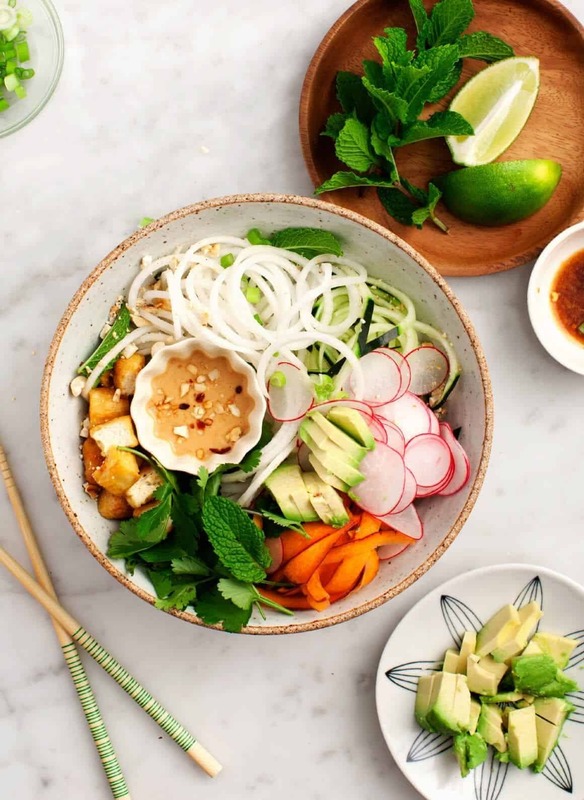 Green smoothies, fresh bowls of vegetables, and hearty stews are all over social media. There’s not a cookie in sight and we don’t care because gorgeous healthy food is in abundance. For me, eating lighter doesn’t require juice cleanses or food fasts. 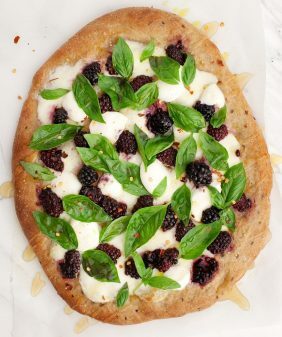 I don’t like to feel hungry or deprived so instead I turn to recipes like these, a collection of my personal favorite plant-forward recipes that are both delicious and satisfying. (Click on the links OR the photos themselves to go directly to the recipes). 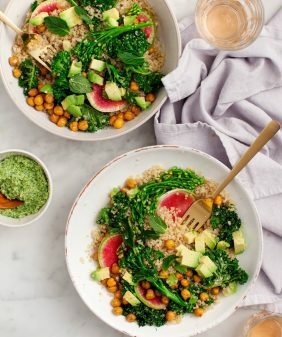 If I wasn’t constantly working on new recipes, I would keep the components for this bowl prepped and ready at all times so I eat this every single day. The “noodles” here are made with spiralized daikon which have a wonderful crisp texture. There’s a tangy tamari-lime sauce and a creamy cashew sauce to serve on the side. I know, two sauces sounds like extra work, but I just mixed some of sauce #1 with cashew butter, and voila – 2 sauces. The first sauce is very light, and the creamy cashew sauce is rich, so they work together nicely. This is a hearty salad for cold winter days. 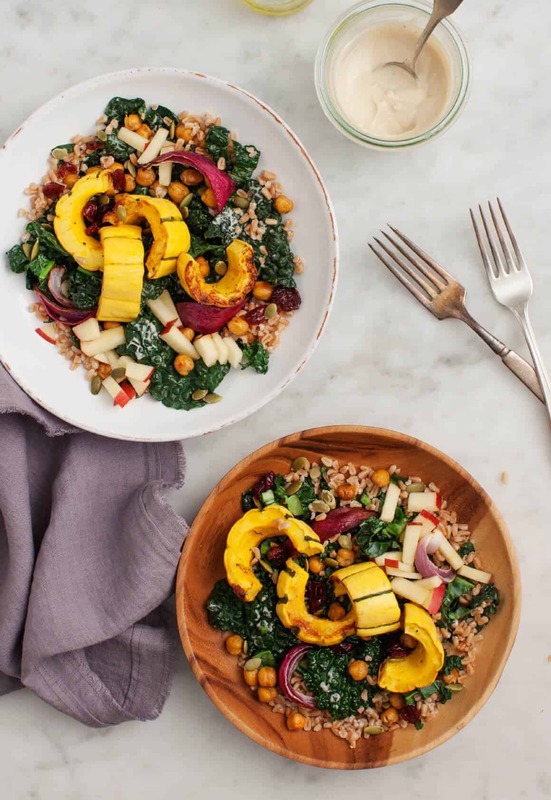 Roasted delicata squash, roasted chickpeas, and roasted red onions are served on top of massaged kale and nutty farro with a rich maple tahini sauce. Feel free to use any roasted winter squash that you have. This dinner is so quick and satisfying. But what I love most about it is that it uses not just broccoli florets, but also the stem of the broccoli. It feels wasteful to toss the biggest part of the vegetable. Instead, try chopping the broccoli stem into thin pieces and using it in recipes like this one. I love this as a vegetarian main dish. A slab of cauliflower can be SO filling, especially when served with this hearty, tangy chickpea romesco sauce. I don’t think this recipe got as much love as it should have. I accidentally posted this one last year during that week when the price of cauliflower had suddenly shot up. I absolutely love this stew and it’s been a favorite in my family’s dinner rotation. It’s packed with kale, kale stems, cauliflower, tomatoes, herb and chickpeas. Stir in a little Hemp Seed & Kale Pesto and it’s the perfect healthy winter meal. 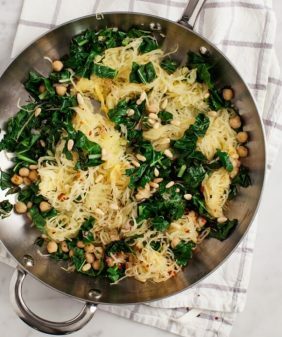 After you make the Cauliflower Stew (above), save the leftover kale pesto and top it onto this delicious lemony spaghetti squash the next night. So simple, so delicious. This recipe also made it on our Top Recipes of 2016 list – I’m putting it on this list as well because it’s such an easy and versatile way to eat tons of veggies. While I can’t take credit for this one (it’s from Heidi Swanson’s book Near and Far), it’s still in my regular rotation. This is the quickest soup I have ever made, but I love it because it packs a spicy green punch (hence the name). A total win win in my opinion. I make a version of this bowl all the time. 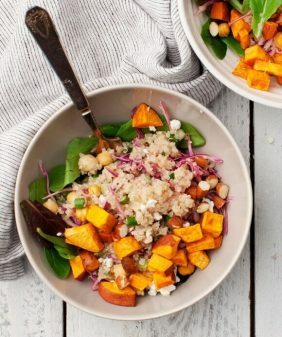 This one is specifically spring-themed, but toss some sweet potatoes in here and it works for winter just as well. Ok, I’ve shared my go-to healthy recipes, let me know what some of yours are! So many great choices to chose from here! So much delicious inspiration! 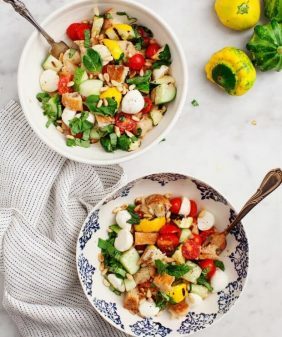 That Lemon Pesto Spaghetti Squash…omg. I’ve never read a blog post before where I wanted to eat every single recipe recommended, but this is an exception! I’m bookmarking the page to refer to, thank you for so many great suggestions. Your recipes are so colorful and look so delicious. Thanks Flora! I hope you enjoy the recipes! I love your idea about broccoli stems!!! That always drives me crazy! I think they taste a lot like kohlrabi, which I usually spiralize into “noodles” so I have been meaning to try that with them as well! Hi Maria, that’s such a great idea to spiralize the broccoli stem! Great round up Jeanine! Thanks so much for the continued inspiration. I love the positive momentum that generates in January! Always motivating and inspiring. 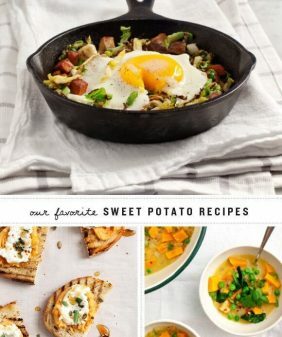 Lovely recipes and lovely photos too, I love how these recipes cheer up the palate in the middle of gray, rainy January. I’ve had enough of thick and dreary winter soups.